Now that Microsoft and Digital Foundry have finally provided actual hardware details, we can finally talk without speculation. Before we go any further, I know there are going to be people that are likely disappointment with this reveal. For months, people have speculated on if Project Scorpio would use either AMD’s latest CPU/GPU, Ryzen, and Vega, or the previous generation Jaguar and Polaris. It, of course, got the latter, which means the system received the same CPU/GPU as the Xbox One, PS4, and PS4 Pro. There’s more going on here that meets the eye. And while I really don’t want to come off super technical, after listening to the reveal several times, I believe that Microsoft is on to something. This isn’t any sort of Fanboy talk, as I’m still holding MS on the hook for other things. When it comes to what was shown off, I’m impressed. Especially with the design and implementation of the DirectX API being baked into the GPU. So, let’s break that down. When you run a game now, either on the Xbox or PC, you have to do calls to the API, which are transferred to the hardware. This, of course, renders what we see on screen. What MS has done here doesn’t change this, but does provide API calls directly to the hardware or bare-metal.What normally happens; Game -> software / Direct X API -> CPU -> GPU. With the API being incorporated into the hardware, we’ll see this instead; Game -> software calls -> Project Scorpio GPU. Meaning the calls would go directly to the GPU. The result would be faster calls, faster rendering, as to what Digital Foundry confirmed. This is not the conventional CPU/GPU setup that we’ve seen before. This is a highly customized configuration, using AMD’s Jaguar as the base. I feel that needs to be stressed as I’m sure people are going to be throwing their arms in the air about this. This is the first of it’s kind and the system will greatly benefit from that and I don’t think this will be understood unless you have a good understanding of how API calls work. So again, this is not Jaguar. Instead, think of it as Jaguar enhanced. Of course, the eventual question regarding how this stacks up to a gaming PC will be asked, so let’s try and answer this. Could this beat out a PC? That really depends, I believe the optimization and customization here definitely provides some challenge to PCs. It would be able to match up to a mid-level PC, given the game. A higher end PC, I don’t think so. I know that may sound silly to many, but that’s just how I see the CPU/GPU changes being so important here. Just clear the air, there was some testing with several GPU’s and Forza Motorsport 6: Apex. This bit comes from the full article, but it’s worth mentioning here. 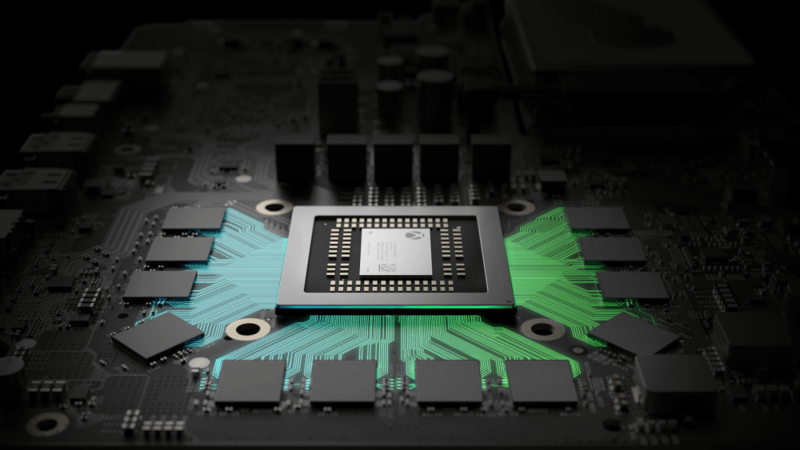 “From what I’ve seen so far, there is some evidence that Scorpio’s true 4K performance could pose a challenge to the likes of Nvidia’s GTX 1070 and AMD’s Fury X-class hardware. I’ve seen Microsoft’s new console running a Forza Motorsport 6-level experience locked to 4K60 on the equivalent to PC’s ultra settings – cranking up the quality presets to obscene levels was one of the first things developer Turn 10 did when confronted with the sheer amount of headroom it had left after a straight Xbox One port. Also worth mentioning is that the hardware has proven to meet Microsoft’s claims of six teraflops To put that into perspective, this is nearly five times more than the Xbox One (1.31 Tflop), and on par with Nvidia’s GTX 1070 GPU. Though, if I’m being honest, I was hoping that we’d see a bit more power squeezed out of the hardware. The other major change is the omission of the ESRAM which was found in the Xbox One. Replacing it are 12 GDDR5 memory chips, that’s 4GB more than the Xbox One, with 4GB of that being used for OS reservations. All of this running on a 384-bit memory interface, which is surprising as I thought it would utilize a 256-bit instead. Which makes sense as the push here is 4K. Currently, 256-bit memory interfaces are more than enough for 1080p and 1440p, so the extra push here was implemented for the extra pixels at the 4K resolution. Gaming-wise, we weren’t showing anything as this was mainly a hardware reveal. But there was mention regarding Forza Motorsport 6, which shown off to Rich Leadbetter. The title was able to run at a native 4K 1:1 resolution, on an earlier build of Project Scorpio and with no optimization at all. This was basically a straight port of the Xbox One version of the title and it ran at 4K@60FPS. Rich did point out that there were some drops in frame rate, down to the 55FPS, with fewer cars on the course as well, and as high as 70FPS at times as well. Per the screenshot we were shown, the GPU was running close to %80. That’s good news and only makes me wonder how it would look and run when it finally is optimized. So in the end, this all sounds very nice. 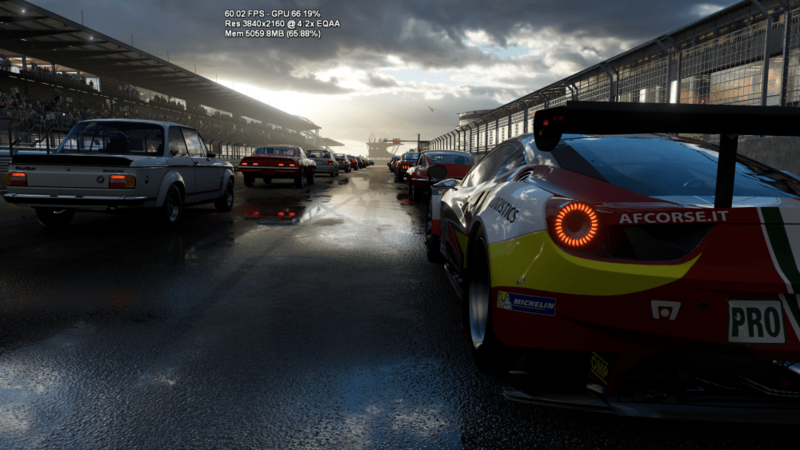 The hardware is impressive, the Forza Motorsport 6 4K screenshot equally impressive. Yet, we weren’t shown and footage and we likely won’t until E3 2017. We also didn’t get any actual look at the hardware, outside of the circuit board, so we couldn’t see if the other claims, such as the smaller footprint, were true or not. Price-wise, it’s looking more and more that this will be around the $499 range, if not more. We still don’t have a name for the system or the actual launch date. Of course, the success of the Project Scorpio will also greatly depends on the Xbox gaming line-up, which as we know isn’t the best right now. The first party offering is there if you enjoy Forza and Halo, but that’s mainly it. I’m sure we’ll hear and see more about this as we get closer to E3 2017. Still, it was nice to finally a peek at the actual hardware and erase some doubt that surrounded the system. We’ll definitely be keeping our eyes pointed at the Project Scorpio, that’s for sure. For more on Project Scorpio, be sure to check out Eurogamer and Digitial Foundry’s complete write up here.